The Idaho Batholith is a composite mass of granitic plutons covering approximately 15,400 square miles in central Idaho. The outer perimeter of the batholith is irregular and in plan view it has an hourglass shape. It is approximately 200 miles long in the north-south direction and averages about 75 miles wide in an east-west direction. Armstrong and others (1977) called the northern part of the hourglass the "Bitterroot" lobe and the southern part the "Atlanta" lobe. He also proposed that most of the southern lobe was emplaced 75 to 100 million years ago (Late Cretaceous); whereas the northern lobe was emplaced 70 to 80 million years ago. Armstrong (1977) further noted that older plutons of Jurassic age occur on the northwest side of the Bitterroot lobe and many Eocene plutons have intruded the eastern side of the Atlanta lobe of the batholith. On the western side of the batholith, there are more mafic plutons (quartz diorites or tonalites) than to the east. Radiometric dates and field relationships, where plutons of the batholith cut older rocks, restrict the age of the Idaho Batholith to an interval between 180 million years ago (Late Triassic) to 45 million years ago (Eocene); however, the dominant interval of emplacement was Early to Middle Cretaceous. There is a general west-to-east decrease in age for plutons of the batholith. The western margin of the Atlanta lobe is strongly folded and metamorphosed into gneissic rocks which are well exposed near McCall. The largest pluton mapped to date is a quartz monzonite in the vicinity of Warm Lake. It is about 124 miles in a north-south direction and more than 30 miles wide. However, many of the plutons of the batholith have not been delineated by geologic mapping. Both lobes of the batholith have a different composition on the west than the east side. On the west side the rocks are tonalites or quartz diorites, whereas on the east side they range from granodiorites to granites. The boundary between the two composition types also coincides with the 0.704 Sr87/Sr 86 boundary and also the boundary between the Mesozoic and Paleozoic eugeoclinal accreted rocks on the west with the continental Precambrian rocks on the east side (Hyndman, 1985). According to Hyndman, (1985), the tonalites on the west side originated by the melting of oceanic rocks near the subduction zone. Evidence that these tonalites were derived from oceanic rocks and have not been contaminated by melting of continental sedimentary rocks include: (1) low Sr isotope ratios, (2) low SiO2, and K20, (3) high FeO-MgOCaO, and (4) 13 to 30 percent mafic minerals. Hyndman (1985) further proposed that the granodiorite and granites on the east side originated by melting of Belt Supergroup or pre-Belt continental crustal rocks. These continental sedimentary rocks were melted by hot mafic magmas rising from the same subduction zone that produced the tonalites. Evidence that the granodiorites and the granites on the east side contain substantial melted continental sedimentary rock include: (1) high Sr isotope ratios, (2) high SiO, and K20, (3) abundant muscovite-orthoclase-quartz minerals, and (4) rounded zircons dated at 1700 to 1800 million years derived from the continental crust of pre-Belt age. Hornblende-biotite tonalite and quartz diorite plutons were emplaced at mesozonal levels in the western and northwestern margin of the Bitterroot lobe. According to Toth (1985), plutons were small and isolated igneous-type granites and were intruded during regional compression in the Cretaceous (105 to 86 m.y. ago). Later, during Paleocene time, plutons of foliated muscovite-biotite granodiorite and monogranite plutons were intruded. These plutons of sedimentary-type granites, are chemically similar and represent most of the bitterroot lobe. Toth and Stacey (1985) place the period of intrusion to be 70 m.y. ago to 50 m.y. ago, with most plutons intruded between 65 to 50 m.y. ago. Toth (1985) also observed large plutons and dikes of diorite in the southern and central parts of the Bitterroot lobe. These dikes are derived from the mantle and may have provided some of the heat necessary to cause partial melting of the crust to form the sedimentary-type granites of the Bitterroot lobe. From the west side to the core there is an increase towards the east in Si02 and a decrease to the east in CaO, MgO and Al203. From the core to the east side there is less SiO2 and more CaO, MgO, and Al203. The western side is composed of tonalite 95 to 8 5 million years old. The batholith core is biotite granodiorite; and the eastern side of the lobe is muscovite-biotite granite approximately 76 to 72 million years old. Rocks in western Idaho have very different initial Sr 87/Sr 86 ratios. All the plutonic rocks west of the dashed line have low initial ratios (0.7043) whereas, all rocks to the east of the line have high initial ratios (0.7055). This change in ratios is abrupt and remarkable. In Idaho, the change is made in less than a distance of 6 miles. Although there is no difference in petrology of the rocks on either side of the line, there is a difference in the geologic environment in the two areas. For example, the low ratios are measured where plutons are intruded into Paleozoic or Mesozoic eugeoclinal rocks on the west side of the line. East of the line where the initial ratios are high, the plutons were intruded into Precambrian rocks. In some areas, the existence of Precambrian rocks are inferred because of cover by more recent volcanic or sedimentary rocks. Armstrong (1977) suggests that the high ratios of the plutons east of the line were caused by the assimilation of large quantities of crust by magmas ascending from the mantle. Conversely, west of the line, magmas ascending from the mantle rise through young crust which has not had sufficient time to be enriched in Sr87. Therefore, plutons will form with low ratios. Armstrong (1977) speculates that the variability of the initial ratios of plutons east of the line indicates assimilation of rocks ranging in age from 500 million to as many as 2.7 billion years old. Therefore, the dashed line drawn to represent the change in initial ratios also represents the boundary between the Paleozoic and Mesozoic eugeocline and the older Precambrian crust. The dashed line also marks the suture line along which the Paleozoic and Mesozoic rocks were accreted onto the North American continent during the Mesozoic. In the vicinity of Orofino, the isotopic boundary turns abruptly due west into eastern Washington. The trans-Idaho discontinuity (Yates, 19 68) is also thought to transect the area near Orofino in a west-northwest trend. On the basis of field observations and geophysical evidence, Armstrong and others (1977) proposed that the trans-Idaho discontinuity changes direction near Orofino and follows the isotopic boundary for more than 60 miles. This portion of the trans-Idaho discontinuity may have been a transform fault active in Late Precambrian time. Stewart (1972) proposed that the onset of north-south rifting in Late Precambrian time initiated the Phanerozoic Cordilleran geosyncline. deformation at the suture zone; tectonism caused suturing of the island arc. undeformed tonalite and granodiorite plutons emplaced. undeformed muscovite-biotite granite passively emplaced into tonalite and metamorphic rocks. Pegmatite and aplite dikes were formed during the late stages of each plutonic intrusion. The mineralogy of the dikes is similar to the enclosing intrusive. In some cases, pegmatite dikes cut aplite dikes and in other cases the reverse is true. These dikes appear to be concentrated near Eocene plutons and occur in the northeast-trending, trans-Challis fracture zone. 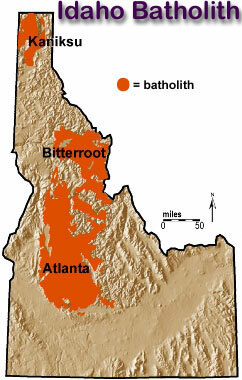 According to Foster (1986), the Bitterroot lobe of the Idaho Batholith contains numerous mafic dikes which make up about 20 percent of the total rock. These tabular dikes average about 8 feet thick and trend east-northeast with a vertical dip. On the basis of field evidence, Foster believes the dikes were emplaced while the batholith was still hot. Each pluton rises as a tapered cylindrical body. As a pluton is emplaced, both its outer margin and the surrounding country rock become deformed. Therefore the foliation adjacent to a pluton is generally conformable to its boundaries and to the foliation within the pluton. Rock in and just above the zone of pluton generation are high-grade gneisses and migmatites (mixed igneous and metamorphic rock). These rocks have near-horizontal foliation. The overlying zone which is 3 to 10 miles deep, is volumetrically expanded by pluton emplacement. This expansion causes the underlying crustal zone to be extended laterally by plastic flow causing itself to be thinned and flattened. In some Precambrian shield areas, there has been sufficient uplift and erosion to see exposures of gneisses with subhorizontal foliation. The shallow crustal level above the zone of lateral compression is subjected to horizontal tension both from the upward pressure caused by the rising pluton and the lateral movement outward of the rocks in the zone of compression. Therefore the upper crustal rocks are .pulled apart into large fault blocks. The boundary between the upper crustal roof rocks and the zone of pluton emplacement is a plane or zone of decoupling by low-angle faulting. The rocks in the lower zone of emplacement deform as a plastic whereas the upper crustal roof rocks deform as a brittle material. Upon decoupling, upper crustal roof rocks slide away in every direction (Gastil, 1979). Granitic outcrops of the Idaho Batholith are easily recognizable in the field. Under close inspection, granite has a salt and pepper appearance with the dark minerals of biotite mica and hornblende and light minerals of plagioclase and quartz. The constituent minerals are up to an inch or more in diameter and can readily be identified without a hand lens. Of course, many minor accessory minerals are too small to be identified with the unaided eye. Weathered outcrops of granite have a distinctive appearance and can in some cases be identified at a mile or more distance. Coloration tends to be very light gray to very light tan, and in some places chalk white due to leaching by hot water. Outcrops are generally smooth and rounded due in part to surface weathering by granular disintegration and in some cases exfoliation where layer after layer is removed from the surface. Most exposures are cut by one or more sets of fractures which may give the outcrop a blocky appearance. Granite and basalt are among the easiest rocks in Idaho to identify. This module was created by Digital Atlas staff members. Please see Source Information.